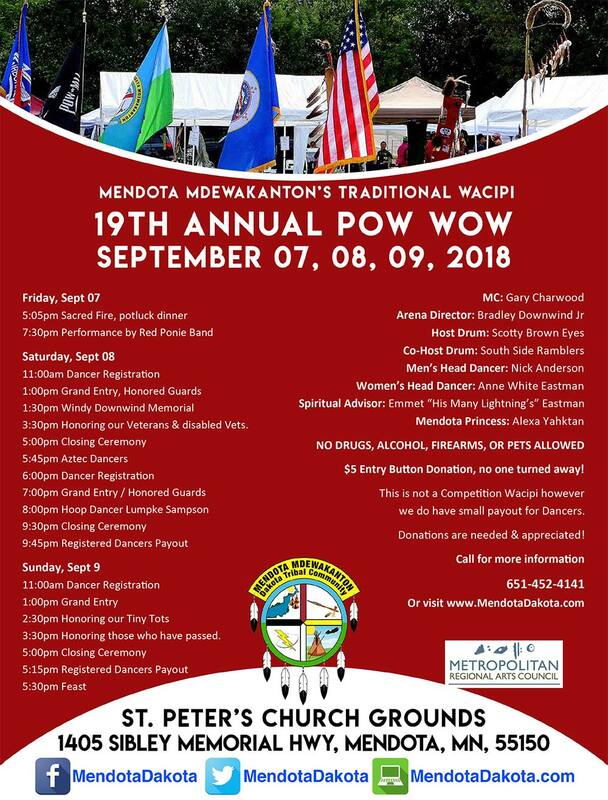 We hope to see you for the Mendota Mdewakanton 2018 POW WOW! Please use this flyer only as of 8-16-2016. Posted in FEATURED, POW WOW | Tagged Please use this flyer only as of 8-16-2016. Mendota Pow Wow from Town Square Television on Vimeo. This story will appear as a segment on the news-magazine show, INSIGHT 7, which will play back on Community Channel 14 until October 22nd. Below are the playback times. Mendota Mdewakanton 16th Wacipi fund, please help! Our tribe is planning its 16th Annual Powwow (Wacipi) and are very low on funds for this year. We appreciate any help you can give us. This powwow is an educational and exciting depiction of tribal culture and heritage. Native American dancers, drummers, and authentic food (indian tacos, fry bread, wojapi jelly and then some) are just part of the festivities. See authentic tipis and Native American clothing. If you can’t contribute – come join us on September 11th and 13th – Mendota, MN. We appreciate and thank you for your contribution. Thank you Gary Shull and Pam Fagan for putting us on. Sharon and the Mendota Tribal Council.